Today I journeyed to Boston, Massachusetts by way of the Columbian Centinel dated October 24, 1812. I found several reports in regards to the battle of Queenston, Canada. The reporting begins with Col. Van Rensselaer’s troops having crossed the Niagara River into Upper-Canada and that the batteries in Queenston were attacked . It is stated that Fort George was to have been immediately attacked with troops in Buffalo joining them. 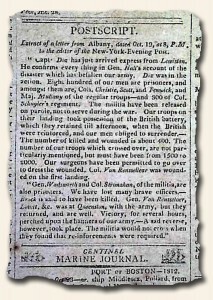 Further reports continue with actual loss of the battle and the Col. Van Rensselaer being shot and Gen. Wadsworth being missing, assumed dead. It is interesting to read the different accounts within one issue.